These are clocks that are on order and should be available in the future. 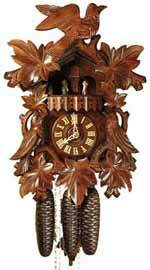 Black Forest 8 day wind Rombach and Haas cuckoo clock will truly delight you. Seven deeply carved grape leaves and three birds adorn the clock around the border. At the top of the hour, the hand carved cuckoo emerges from his door to call the number of hours as the dancers move along with the melodies produced by real wooden whistles of the Swiss made music box This is an affordable 8 day musical cuckoo clock with excellent finish and carvings. The beautifully carved leaves overlay a traditional "Bahnhausle" style frame, the moving dancers are dressed in traditional Black Forest dress, and the sound of the large music box is exquisite. The dial, hands, and numbers and bird are all of solid wood. It is an official Black Forest Clock, certified by the VDS. Size: Height 17", Width 12", Depth 8"
Bent hardwood case, brown cherry finish. Decorative tambour style with burl accents on front and dentil molding on base. Wooden bezel and full scroll case design with traditional Arabic numerals with metal filigree hands on off-white dial. Bulova Harmonic triple-chime movement plays choice of Westminster, Ave Maria or Bim-Bam melody on the hour. Quarter-hour Westminster chime and strike available. Adjustable volume control. Automatic night shut-off switch available. Engraving plate included. Requires (1) AA (2) C batteries.One year warranty and Free Shipping. Size: H: 8.5" W: 14.5" D: 5.25"
Elegant Nautical box with a North Star Inlay in a cherry finish. The solid select cherry case displays a Brass ships bell clock featuring a Mechanical 8-day striking movement and a precision Barometer with Thermometer. Three year warranty and Free Shipping. German made brass Quartz ship's bell clock. Accurate quartz movement plays Ship's Bell through a speaker. Automatic nightime shut-off switch. Operates on 2 "C" size Duracell batteries. Solid polished brass case features a quartz movement having authentic ship's bell strike. The dial is white with Roman numerals and spade hands. The hinged bezel has a beveled glass lens and screw-down fastener. Three year warranty and Free Shipping.